Many of us this summer we shocked to learn that Caboose Hobbies would at first be moving then later closing altogether. The story starts back on July 18th when the store was informed by the building ownership they would be selling the property and that Caboose needed to move and quickly. Caboose announced a moving sale on everything in the store. Then just a month later on August 17th the owners of Caboose Duane and Johanna Miller announced the decision to retire instead they intended to close the doors of the hobby store altogether on the September 25th. Ultimately the store closed its doors early at the Broadway location on September 11th. At this point it certainly seemed like a sad ending with no model train store in Denver, then took a surprising twist on September 22nd. On Caboose Hobbies Facebook page a post eluded to an exciting announcement. Caboose Hobbies had a new owner and a new name Caboose which would reopen in a new location (we know now its at 10800 W Alameda Ave Lakewood, Colorado) and it slated to open before the end of the year. It remains to been seen at this point if the club will have an opportunity to renew its long-standing sponsorship by Caboose under the new ownership. But everyone is just excited to see that the store will still be around. Brian sets up his train in staging as Kip packs up his train. The club wrapped up our setup at the 2016 Rocky Mountain NMRA Regional Convention at the Hotel Escalante in Colorado Springs, Colorado this past weekend. The convention was a week-long event culminating with the train show the last three days of the event. 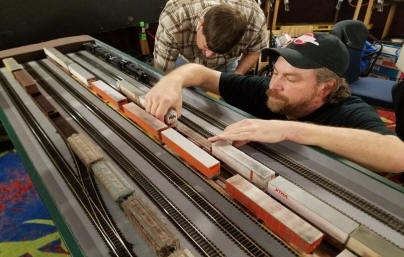 There were over 14 events in addition to the train show. Our layout setup, operation and tear-down was super smooth thanks to a full compliment of members for this local show. The convention was surprisingly lightly attended but had good attendance from train show open to the public on Friday and Saturday to the public. Many of the members attended several of conventions modeling seminars and the rock carving of injected foam board seemed to be the most enlightening session. There were a couple of highlights for the layout. Brian Bates bought some of his latest Modern Missouri Pacific painted locomotives, a full set of GP60s painted in his modern interpretation of the MoPac running an priority piggyback train. We staged several photos and video of trains entering and exiting the layout staging yard of the layout. Brian has since posted them to his Modern MoPac Facebook page. Its really an interesting concept to model in the hobby and has been getting a lot attention as of late. You can check it out his concept of proto freelancing of the Missouri Pacific fallen flag railroad here. For the first time in about two years we had included the Webster Caterpillar modules into the floor plan. Damage in transportation after the 2014 Sherman Hill show sidelined the modules until repairs and renovation of the parking surface of the Byers Transfer facility were prioritized and completed. 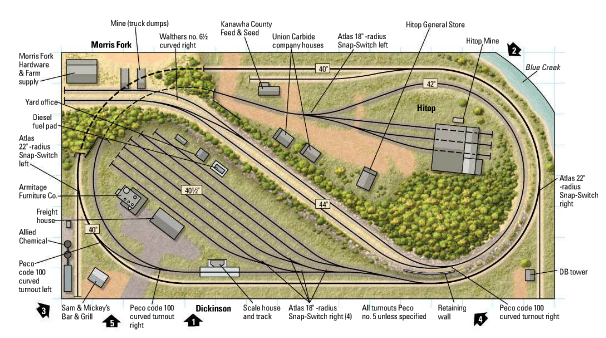 The modules includes to large industries on the CGW layout highlighted by a full-service Caterpillar dealership. You can check out the full photo album from the Rocky Mountain NMRA Regional Convention on the club's Facebook page here. 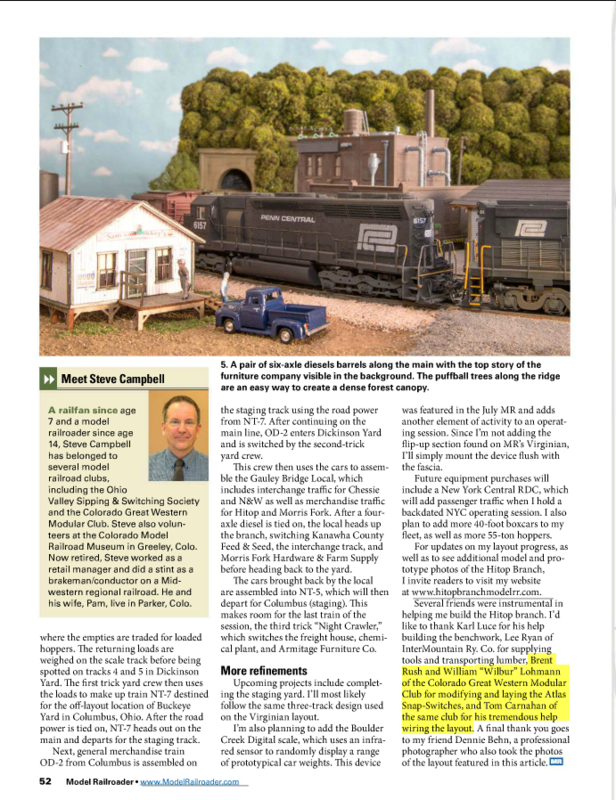 In the March 2016 issue of Model Railroader you will find an article by our own Steve Campbell about the construction of his Hitop Branch layout. 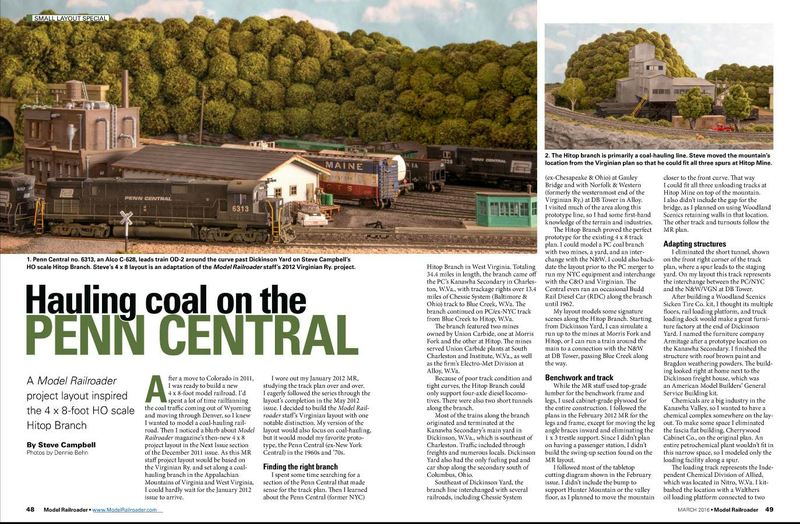 In the 3 page article he describes how he used the Model Railroader's 2012 project layout as the basis for his interpretation of the Penn Central's Hitop branch in West Virginia. He details the changes he made to the MR 4'x8' project layout during construction to producing a layout that fits nicely into his one car garage. Steve was nice enough to mention the club and some of the members in the article. Steve continues to improve and operates the Hitop Branch layout on a regular basis. To learn more about Steve's layout check out his blog here. for regular updates. Below is a scan of the article.